While Dickey Betts classic country solo album Highway Call deserves its own 24-bit remastering job, Raven Records from Australia do what they do best: issue a single-disc retrospective that gets to the heart of the matter of Betts as a solo artist. 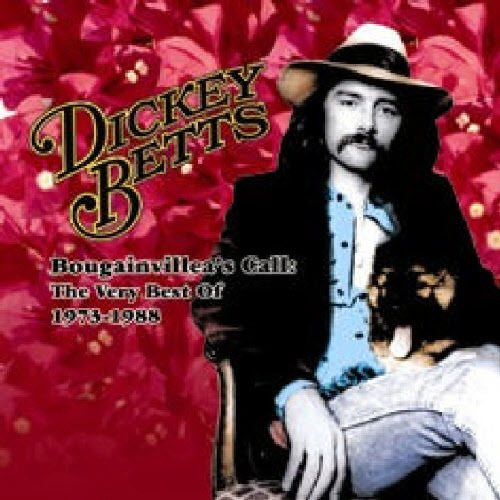 There are 17 cuts on Very Best of Dickey Betts: 1973-1978 Bougainvilleas Call, and they touch on most aspects of Betts‘ recording career with the exception of his earliest sides with the Allman Brothers. The sides on Raven’s collection are those which forged his individual identity as an artist. The first four tracks — “Long Time Gone,” “Rain,” “Highway Call,” and “Let Nature Sing” — are the signature pieces of an album that was as defining asWillie Nelson and Waylon Jennings‘ albums were: they were a re-defining of country music in the early ’70s. Of course, “Ramblin’ Man,” from the Allman Brothers‘ first posthumous Duane Allman/Berry Oakley album, was recorded in 1973, and became the band’s single greatest hit. Betts emerged as the band’s second lead vocalist. There’s the fine Jimmie Rodgers cover “No Hard Times” from the Hotels, Motels and Road Shows sampler on Capricorn as well. But while all these tracks are essential to Bettsidentity as a solo act, his Great Southern albums are spotty, and here is where the Raven compilation excels. It does the job of pulling the very best of the twin-lead-guitar band’s work (the other lead picker was Dan Toler). One suspects rather than actual material problems, production was more of an issue, taking the sizzling life of this live band and reducing it to a compressed entity that could be tidily marketed. Too bad. The proof is in the Raven remastered sides. Even after this treatment, this sounds a bit wooden when compared with the Highway Call and Allman Brothers tracks. Nonetheless, the moving “Bougainvillea” is here. It is equal parts Hendrix‘s “Little Wing” and the Allman‘s “Melissa” and melds rock, country, and jazz in one of the most unique ways on recorded tape. Betts‘ vocal here is the most emotional he’s ever recorded, and the slippery country funk of “Sweet Virginia” (not the Rolling Stones tune). There is one throwaway here, in Betts jamming with Charlie Daniels in one of those horrid Volunteer Jam sessions that stunk up the bins in the mid- to late-’70s. The best of the secondGreat Southern album, Atlanta’s Burning Down, including the title cut, is here, and finally, there are a pair of tunes from the Dickey Betts Band in 1988 with the core of what would become Gov’t Mule,Warren Haynes and Matt Abts. It’s a solid listen with one dead dog that can easily be skipped. Recommended.